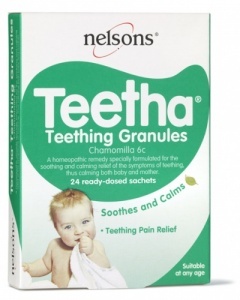 Nelsons Teetha is a homeopathic remedy specially designed for the soothing and calming relief of the symptoms of teething, thus calming both baby and mother. Available in ready-dosed, sugar-free powder or easily applied gel that simply dissolves in your baby's mouth to quickly ease the pain of teething. It contains 6c homeopathic potency of gentle Chamomilla, so it works with the whole body to soothe; calming your baby, as well as relieving discomfort. As the teething process can go on for up to 18 months you probably want to find a natural remedy that will work in tune with your baby's body and one that is safe enough to be used every day. Nelsons Teetha is a firm favourite among parents for generations. The natural, sugar-free granules or gel work with the whole body to soothe and calm your baby, and relieve the pain and discomfort of teething. The pleasant tasting powders are ready dosed so they can be taken anytime, anywhere. Just tip into your baby's mouth, spoon-feed or apply with your finger. These granules are great for helping our baby with teething. They seem to chill her out a bit. Natural ingredients that you can give from 3 months. Tricky to give to the younger baby as you need to put it on a spoon but from 4 months on it's easier. My baby loves these and stops crying as soon as she sees me opening the packet, so they have got to be doing something good. They are cheaper than in the chemist also.